24K Gold Premium First Essence(150ml): This product makes rough skin smooth and provides elasticity. The honeysuckle extract supplies water to skin and helps to gain cleaner skin. It boosts your skin condition and has excellent absorption properties. 24K Gold Premium First Cream(50gm): This cream makes skin smooth and provides elasticity. It’s excellent for rough, sensitive, dry and pigmented skin. It provides all day moist and glossy skin care. 24K Gold Premium First Eye Patch(60ml): The condensed hydrogel eye-patch gives perfect nutrition and moisture on your eye area. The hyaluronic acid and EGF, diamond powder and gold extracts provides a soothing effect for your eyes. Pure SYN-AKE Anti Wrinkle & Whitening Toner by Secret Key(150ml): Anti-wrinkle and whitening toner gives a dual effect of whitening and wrinkle reduction. It spreads smoothly on your skin with nutrients and absorbs well with continuous moisture which relaxes the skin. Pure SYN-AKE Anti Wrinkle & Whitening Emulsion by Secret Key(150ml): This is a basic line of skin care that not only treats the wrinkles on skin, but also fills in the space between wrinkles inside the skin. It contains sosdium – hyaluronate, a natural moisturizing factor (NMF) is included to eliminate substances such as elastine and maintains oil and water moisture for smoothness. Pure SYN-AKE Anti Wrinkle & Whitening Cream by Secret Key(50gm): SYN-AKE cream provides abundant nutrients to skin and helps with skin elasticity improvement. KFDA approved substances, arbutin and adenosine are included in the product for treatment of healthy and vivacious skin. Shea butter, panthenol and aleovera are extremely good for moisture and preservation of your skin. Pure SYN-AKE Anti Wrinkle & Whitening Ampoule by Secret Key(30ml): Whitening Ampolue gives you a nourishing texture for a smoothening glide to skin, sustaining moisture. It contains sosdium – hyaluronate, a natural moisturizing factor (NMF) to control water oil balance and makes skin more moist. It is paraben-free, mineral-oil free, animal oil free and pigment free. Snow White Cleansing Foam(150gm): It contains glutathione and pearl powder for clear and cleaner skin. It cleanses skin impurities deep inside with rich bubbles and exfoliates the sensitive skin without irritation and helps to increase skin’s flexibility. Suitable for sensitive and all other skin types. For Acne skin, please consult your dermatologist first. Snow White Milky Lotion(120gm): This product gives an immediate brightening effect as it contains whitening functional ingredients. Recommended for all body parts that needs whitening including face. Snow White Milky Pack(200gm): This product gives a natural looking brightening effect from face to body giving you a photo-shopped result. Involves various enzyme reactions in order to suppress the creation of melanin that helps keeping skin clear and bright. Usage: Apply to wet skin, rub a small amount and massage with circular movements, then rinse off with warm water. Snow White Spot Gel(65gm): This intensive whitening gel cares for dark skin is great to apply onto face, armpit, elbow and blackened skin which is caused by friction. This watery gel type cream makes your skin super moist and it includes Aloe Vera leaf extracts, portuluca extracts an acerola extracts. Snow White Cream(50gm): It’s an all-in-one base facial tone cream. 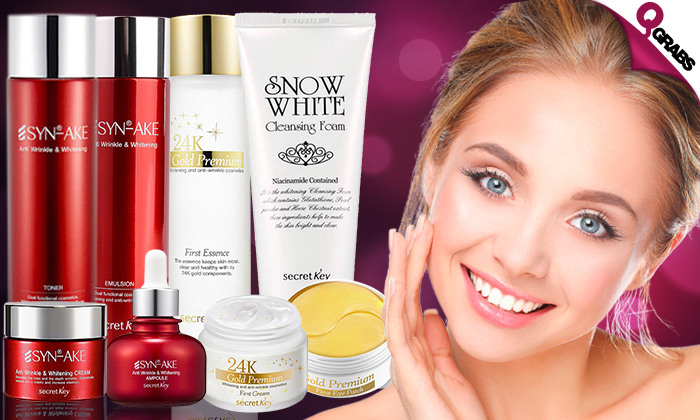 With Secret Key Snow White Cream, you can feel your skin being brighter with regular and continuous usage. It instantly provides hydration deeply into your skin. Snow White Moisture Cream(50gm): This cream penetrates deep into the skin making it glossy and radiant from the inside. It soothes skin and includes grape callus culture extracts, hyaluronic acid, fibril extract and grape fruit extract. Snow White Essence(30ml): Includes glutathione, pearl powder and marronnier exrtacts that penetrates deep into the skin making it glossy and radiant from the inside.The oil in the vitamin capsule provides the skin with gloss and assists with hydration of the skin. Snow White Toning Cream(50ml): This whitening cream offers you a bright glow with 7 types of vitamin complex and licorice extracts. It doesn’t get stuck in pores, gives you excellent absorption for smooth and natural skin texture. 24K Gold Premium First Essence(150ml): It makes rough skin smooth and provides elasticity. The honeysuckle extract supplies water to skin and helps to gain cleaner skin. It boosts your skin condition and has excellent absorption properties. 24K Gold Premium First Cream(50gm): This cream with 24k pure Gold makes skin smooth and provides elasticity. It’s excellent for rough, sensitive, dry and pigmented skin. It provides all day moist and glossy skin care. Gold Premium First Eye Patch(60ml): The condensed hydrogel eye-patch gives perfect nutrition and moisture on your eye area. The hyaluronic acid and EGF, diamond powder and gold extracts provides a soothing effect for your eyes. Snow White Cream(50gm): It’s an all-in-one base facial tone cream. You can feel your skin being brighter with regular and continuous usage. It instantly provides hydration deeply into your skin. Brighten up that gorgeous skin with up to 90% off!